PRINCETON – Quentin Schneider had headed into Princeton on July 7 to fetch a part for his mower, which had broken down as equipment tends to do on the first day of haying. The skies were clear and his wife Sheena was about to hang laundry when a vehicle pulled into the yard. A plume of smoke was rising from the forested slope beyond their ranch, about 12 kilometres outside of town on Highway 5A towards Merritt. It looked to be from a large campfire but the only people in the vicinity were loggers. Schneider thanked her visitors for the tip and called it in, but a few minutes later, another car stopped. They could see flames. Schneider began gathering horses, preparing for the worst. Soon, neighbours pulled in, pumping water over the family home and helping pull together equipment and animals. The two Schneider children, seven and 11, pitched in, loading the family car with photo albums while Quentin and another man worked to save equipment. Sheena loaded animals on trailers and drove to Norm and Hallie Breen’s place, five kilometres east. The kids went, too, eventually staying with their grandparents for the duration. The horses, cats, her pot-bellied pig and daughter’s rabbit were saved, but the cattle were a mystery. The fire kept growing and the Schneiders eventually told neighbours to go save their own places. 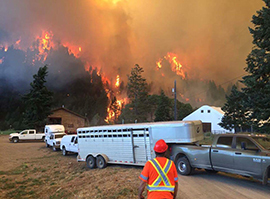 The next morning, while crews struggled to fight fires sparked by 142 lightning strikes in the tinder-dry Cariboo, the Schneiders drove back from Princeton and – with the magnitude of the situation still emerging – were allowed to check their property. While it was tough to leave the property, the Schneiders’ knew their grandfather’s cattle were on local rangeland and at risk so they spent the weekend trucking cattle to safer range. The growth of the fires through the weekend soon saw the evacuation zone widened to include where they were staying, which was an advantage – they no longer had to pass through a checkpoint and so long as they stayed on their own ranch, they couldn’t be forced out. Some looked worse for wear – covered with soot – but the Schneiders were thankful they were alive. By this point, the Schneiders were in touch with Merritt range agrologist Phil Gyug, who worked with fire crews to rescue the animals. Three days later, Gyug took a posse of riders including the Schneiders and Breens up on the range to bring in the animals. By July 15, the entire herd except 14 cow-calf pairs and a few bulls were safely pastured on two fields on the valley floor before being taken to range east of Princeton. The final stragglers appeared the day before the evacuation order was lifted and stayed at the home farm for the rest of the summer. The disaster was hardly what the Schneiders expected when they bought the ranch in 2014 with plans to run 100 head across its 324 acres. Both in their 30s, they had spent a decade working Quentin’s grandfather’s ranch in Cawston. Princeton was a chance to set up for themselves. “[We] finally got it together enough to start our own up here,” Schneider says. But making a new start has thrown them back on the support of family and friends. “You never expect to lose everything – every building, every fence – and to try to be rebuilding it all at one time on top of rounding up your cows, you just start to feel like a crazy person,” Schneider says. With the help of family, fences were rebuilt across the property and a new steel equipment shed was erected that will shelter tools from the weather and allow them to be plugged in so they don’t freeze in temperatures that were already dipping below -20 degrees Celsius in November. Pulling it all together has taken clear thinking as well as determination. Somewhere in between, the Schneiders assembled the paperwork needed to meet the January 31 deadline for AgriRecovery wildfire relief claims. Payments are being made per bred cow and then only for items that couldn’t have been insured. Since the Schneiders ranch outside the local fire district’s boundaries, insurance rates for many items were high and they opted against coverage for many older structures. There’s also no compensation for hay lost when outbuildings burned or production lost on pasture where the 14 cow-calf pairs grazed through the summer. While relief funding is appreciated, the costs of what isn’t covered quickly add up as the ranch undertakes a total rebuild. Post-fire meetings of the Princeton Stock Breeders Association suggest what happened this year could be repeated in the years to come. The association was recently told that BC still has 45 million acres of pine beetle-killed forest, and a quarter-billion acres that haven’t seen fire in a century. This year has ranchers talking about how to face future fires. Range access to rescue cattle is a key issue. While neither Breen nor Schneider lost animals, BC Cattlemen’s is surveying members to gauge the extent of losses province-wide. Princeton ranchers would like to see a permit system linked to premises ID or some other method that would facilitate access. Schneider, for her part, is already looking ahead to calving season. While the paperwork is essential, she expects 80 calves come spring. Relief funding is important but it’s the animals that will put the life back in the family ranch.